Covering a full city block, the elaborate Baltimore City Hall was built between 1867 and 1875. 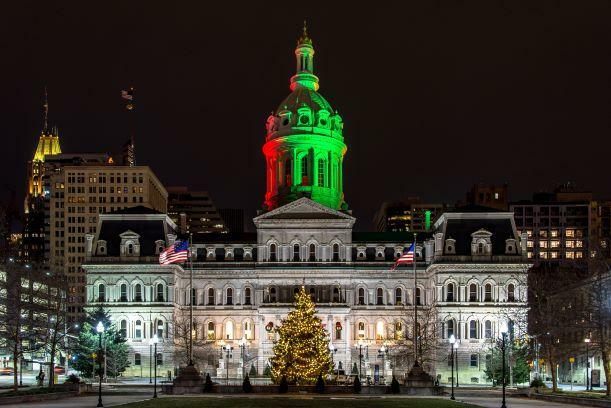 Baltimore City Hall is an excellent example of the public building style (known as Second Empire) popular after the Civil War. Although smaller in size, it is comparable in quality and style to the Eisenhower Executive Office Building in Washington, D.C. and Philadelphia City Hall. The building was the first commission for 22-year-old architect George Frederick. City Hall’s cast-iron dome was designed by engineer Wendell Bollman and manufactured in Baltimore by the same firm that made the U.S. Capitol dome. Inside, the rotunda rises 119 feet to a magnificent dome with a stained glass eye. The building was completely renovated in 1975 making it one of the few original City Halls in the country still used for its original purpose. Some areas, including the Council Chambers and the Mayor's Ceremonial Room, were restored to their original grandeur. In 1971, City Hall was the first structure in Baltimore designated as a city landmark. It was listed in the National Register of Historic Places in 1973.